A blend of 44% Merlot, 53% Cabernet-Sauvignon & 3% Petit-Verdot, this wines has a good bright deep colour with ripe rich fruit on the nose. On the palate characteristics of butter cream and strawberries, raspberries and vanilla, liquorice mint, new oak and grilled meats, coffee with fine tannins. Lots of accidty dry tannins and fruit with good length. A masculine effort and great value for money. 16.5 points. The Wine Advocate - Another sleeper of the vintage from this top-notch Moulis estate, Chasse Spleens dark ruby/purple-tinged 2004 offers ripe black currant and sweet cherry aromas intermixed with subtle herb, underbrush, and oaky notes. Medium-bodied with good flesh as well as an attractive meatiness, it should be consumed over the next decade. 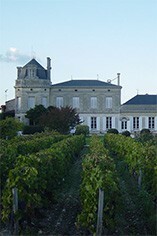 Château Chasse-Spleen is the leading Moulis estate along with Château Poujeaux. Although it is classified only as a Cru Bourgeois, it regularly outperforms many of the Médoc's more renowned classed growths. There are two theories behind the château's rather unusual name: firstly, that, when Lord Byron visited the estate in 1821, he remarked `Quel remède pour chasser le spleen`. Secondly, that it is named after Baudelaire's poem, Spleen. 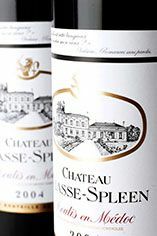 Chasse-Spleen's wines were always noteworthy, though the quality improved dramatically with its acquisition by the Taillan Group, which also owns Château Haut-Bages-Libéral, in 1976. It was run by Bernadette Villars until she and her husband were killed in an accident while hiking in the Pyrénées in 1992. The property is now run by her daughter Claire. Chasse-Spleen's wine is a blend of 65% Cabernet Sauvignon, 30% Merlot and 5% Petit Verdot. It is matured in oak barriques (40% new) for 18 months and is bottled unfiltered. Chasse-Spleen wines are typically deeply-coloured and full-bodied on the palate, displaying oodles of ripe, black fruit, minerals and sometimes hints of chocolate. This is the smallest of the six Médoc communes but boasts a wide variety of soils and terroirs. Moulis is one of the two communal appellations located on the Atlantic side of the Médoc. It is positioned directly south of Listrac and even though it adjoins Margaux - the Médoc appellation with the highest number of Cru Classé châteaux - there are none here. In the context of the Médoc, Moulis is hilly country, studded with a diversity of gravels, limestone and clay. These are sturdy wines, but the best are capable of considerable longevity and are often seductively perfumed. Generally they have more power than Margaux wines, albeit with less finesse and elegance. Recommended Châteaux: Ch. Chasse-Spleen, Ch. Poujeaux, Ch. Maucaillou.